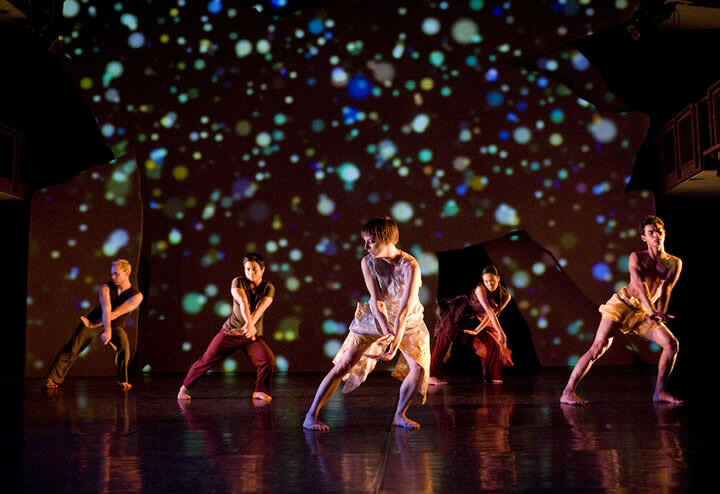 The name Tribal Crackling Wind might conjure images of amulet-draped African warriors or native American rain dancers, but the Canadian dance troupe that performed at Esplanade’s da:ns Festival is actually led by Artistic Director Peter Chin, a 4-time Dora Mavor Moore Award winner. The Dora Mavor Moore Award is a prestigious award presented by the Toronto Alliance for the Performing Arts which honours theatre, dance, and opera productions in the country. His adrenaline-packed creation about the rebirth of the Cambodian art community, Transmission of The Invisible had generated some buzz in the local dance circle. Since its premiere last February in Toronto, it has garnered excellent responses including even a letter of praise from the King of Cambodia, who was President of the Khmer dance association in France and has many years of dance experience under his belt. Created in partnership with Amrita Performing Arts, an international performing arts production company based in Cambodia, the piece was, according to Chin during the post-show dialogue session, conceptualised 6 years ago when he visited Cambodia on a research grant and was inspired by the revival of the classical Khmer dance. The renaissance dates back to the 1980s during the Khmer Rouge era where 90% of dance theatre artistes died under the totalitarian rule. It was then up to the surviving masters of the artistry to make a concerted effort to piece things back together. “Like a phoenix rising out of ashes,” he added. The 66-minute performance kick started with Chin emerging onstage looking troubled. His face and body language were that of a man who, unable to find the right words to speak, expressed himself through dance. 5 other dancers were then gradually introduced throughout the performance, each with their own character, purpose and style. The performance was mostly silent to demonstrate how information such as cultural forms and artistic experiences were transmitted without verbal communication. The only exception was a segment performed by 2 Cambodian dancers, Chy Ratana and Phon Sopheap, where exchanges in Khmer could be heard. Perhaps this was done in order not to lose the essence or the origin of this creation, but it would’ve been more insightful if there had been subtitles provided to aid the understanding of the audience. Though the piece was abstract and open to interpretation, the visual aids in the form of videos taken in Cambodia helped to ignite emotion at certain parts of the performance. A fine example would be the video footage which was played during Heidi Strauss’ solo dance piece, that featured an old lady who was lying down as 2 boys held her weak, wrinkled hand. It was evident that Peter Chin and Cylla von Tiedemann, as the choreographer and videographer of the performance, paid careful attention to minute details in order to relate the videos to the choreography and music. Accompanied mainly by a variety of percussion rhythms and natural environmental sound effects such as the forest and a village, the dancers executed the choreography gracefully and effortlessly. Every eloquent gesture, intricate footwork, swift movement and facial twitch matched every single beat. However, as a member of the audience who stepped into the theatre with a significant level of expectation having read the synopsis and a few articles on the Khmer Rouge era, I was still left confused at some parts. For example, there was a scene where Chy Ratana took centre stage and started chanting in a foreign language while Heidi Strauss, Sean Ling and Andrea Nann moved synchronously behind him. It was difficult to interpret the message behind this and knowing what was being said would have been useful. It was amazing how the 30-minute post-show dialogue session was able to help the audience comprehend the creation better. Props should be given to Peter Chin and the 5 performers for patiently answering questions, sharing their journey in creating this dance piece, and putting on a good show. Transmission of The Invisible was part of Esplanade’s da:ns Festival which took place from Oct 23 to Nov 1 to instill interest, fuel passion and celebrate dance from all over the world. 3.50: What would you pay for a life?